The Messiah will reveal himself in a time called the end of days. He will be a human being born in normal fashion of ordinary parents. His father will be a shortdescendant of King David. He will be a very righteous person and embody the highest standard of morality. He will spread faith in God. The spirit of God will rest on him from the time he will be revealed. He will miraculously battle the forces of evil and idolatry and succeed in destroying both. He will move into a position of being king of the entire world, accepted by both Jew and non-Jew alike. He will be the chief arbiter of justice to ascertain truth and falsehood. He will have a keen ability to advise a person how to rectify and improve his/her life. He will spread the knowledge of Torah on a much deeper level than can be grasped today. He will usher in a period of tranquility, peace, love, awe, and knowledge of God for all mankind. This verse first tells us that kingship over Israel will come from the tribe of Judah. This began with King David who was the first king from the tribe of Judah. Second, the authority whose responsibility is the keeping of the Divine Law will be from the tribe of Judah. Shilo is a name for the Messiah. Once the Messiah arrives, Kings over Israel will forever be from the tribe of Judah. Also, once the Messiah arrives, the authority whose responsibility is the keeping of the Divine Law, will forever be from the tribe of Judah. Furthermore, the nations of the world will assemble and submit to the Messiah. Since King David was the first king from the tribe of Judah and since the Messiah is to come from the tribe of Judah, for over two thousand years throughout Jewish writings there has been an association of Messiah with Son of David. 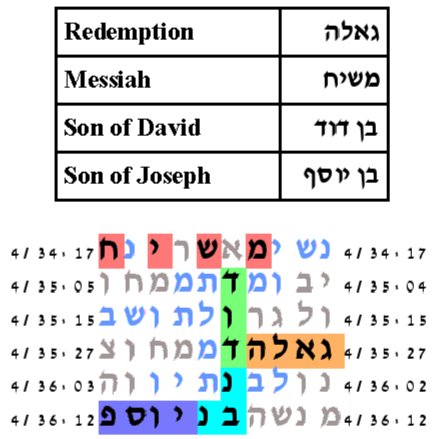 It is natural to pair the key word Who is Messiah with Son of David and look for the smallest area table produced by ELSs of these two key words. With the expected number of ELSs set to 35, the probability that a text from the ELS random placement text population would produce as small a table as that produced by the Torah is 41.5/10,000. The resulting table is shown on the right. The father of King David is Jesse. This suggests that we pair Who is Messiah with Son of Jesse. The resulting smallest area table is not statistically significant. The expected number of ELSs is set to 50. The cylinder size is 871 columns. The probability that a text from the ELS random placement text population would produce as small a table as this is 24.5/100. The expected number of ELSs is set to 10. The cylinder size is 24 columns. The probability that a text from the ELS random placement text population would produce as small a table as this is 41.5/10,000. Dr. Leib Schwartzman examined all the ELSs of Who is Messiah and found another meeting of one of its ELSs with an ELS of Son of Jesse. And in this meeting there is an interesting extension of the ELS for Who is Messiah and an extension for the ELS of Son of Jesse. The extension for the ELS Who is Messiah, prefixing it, is Your request. The ELS phrase then reads Your request: Who is Messiah?. The extension for the ELS Son of Jesse, prefixing it, is For there is no obstacle for the coming of. The ELS phrase then reads For there is no obstacle for the coming of the son of Jesse. But this is not all. Intertwined within the ELS for Son of Jesse is an ELS of I will answer you. The cylinder size is 58 columns. Notice the prefix extensions to the ELSs for Who is Moshiach and Son of Jesse. The second place in the Torah which prophesizes about the Messiah is in Bilaam's last prophecy. I shall see him, but not now. If the children of Israel are worthy and return to God, the Messiah will come early. I shall look at him, but it is not near. If the children of Israel are not worthy and do not return to God on their own initiative, without prompting from God, the Messiah will come in its time. A star has issued from Jacob. In the first case, the star is the metaphor for the Messiah. And a scepter-bearer has risen from Israel.In the second case, the scepter is the metaphor for the Messiah. The word translated as sceptre is שבט, whose most common meaning is staff, rod, or tribe. The shepherds use a rod to guide and correct the sheep. Psalm 23:4 mentions God's rod and staff. A scepter is a special kind of staff or rod. A scepter is a staff that is associated with the highest power and majesty. In many kingdoms, the king would hold the scepter. Before a person could speak to the king, the king would give the scepter to the person to hold, temporarily delegating the speaking authority of the king to the speaker. Speaking to the king without the king's scepter was a serious offence and would carry a death sentence. In the religious context, a staff which is a scepter carries Divine authority and creative force. And he shall pierce the nobles of Moab and undermine all the children of Seth. Edom shall be a conquest and Seir shall be the conquest of his enemies -- and Israel will attain success. This verse references the peoples of Moab, Edom, and Seir. These peoples include the Moslems who shortdescended from Ishmael and those that shortdescended from Lot and the Christians who shortdescended from Esau. In the end of days, these are the peoples who will fight against Israel. And it will appear as if Israel is going to lose. But the Messiah, who will have Divine authority, will come. Israel will be successful and all the nations will in the end submit to the Messiah. We now add the key word Shilo to the key words Who is Messiah and Son of David. With the expected number of ELSs set to 35, the probability that a text from the ELS random placement text population would produce as small an area table as that produced by the Torah 36.5/1,000. The expected number of ELSs is set to 35. The cylinder size is 83. The probability that a text from the ELS random placement text population would produce as small an area table as that produced by the Torah 36.5/1,000. Jewish tradition tells of two redeemers: the Messiah, son of David -- of which we have already made reference -- and the Messiah, son of Joseph. The time of redemption begins with the coming of the Messiah, son of Joseph. The Messiah, son of Joseph will prepare the way for the Messiah, son of David. The preparation will be of a political and military nature to battle the forces that oppress Israel. We therefore explore key word sets that have Son of David and Son of Joseph. Any key word set must contain either Messiah or The Messiah. And it must contain Redemption or The Redemption. The Hebrew word for redemption can be spelled with or without a Vav. There are, therefore, 8 possible key word sets. We show the best table. With expected number of ELSs set to 50, the probability that a text from the ELS random placement text population would produce as small an area table as that produced by the Torah text is smaller than 1/100,000. The expected number of ELSs is set to 50. The cylinder size is 582. The probability that a text from the ELS random placement text population would produce as small an area table as that produced by the Torah is smaller than 1/100,000. All through the prophets there are statements about the Messiah. The prophet Ezekiel tells us directly that when the ingathering of the exiles takes place that the Messiah will be king of Israel. The next verse we quote tells us that the Messiah will come suddenly, meaning that when he comes people will be so occupied with their troubles that they will not be expecting his arrival. Isaiah also tells us of the Messiah. We learn from Isaiah his characteristics.